M.I.C. 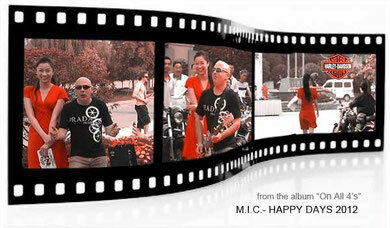 performed "Happy Days" from their album "On All 4's " at the Harley Davidson Show in China. Hi Fuchsia and friends..Thanks again for your ongoing support..You Rock..I hope we can play in Japan again..That would be Great..
Hi Hope we can play in Tokyo next time Fuchsia, It would be Great..Have a Super Summer Holiday.